Greig Coutts was born with the gift/curse of being able to tap rhythyms for hours on his legs, tabletops, railings and other handy surfaces. Thus, it is no surprise that he is nowadays the bodhrán player for The Assassenachs. He also sings backing vocals and is more and more taking on songs as lead vocalist, with Steve Dewar then on the backing. Musically, Greig started playing the accoustic guitar around the age of 13/14. This stopped at around the age of 18 with a feeling of lack of growth and development in the guitar. There was a spell with a few folk, two drum kits and a load of metal piping, but further Greigs’ musical career stood still until meeting up with Steve at a party in Culemborg (NL). 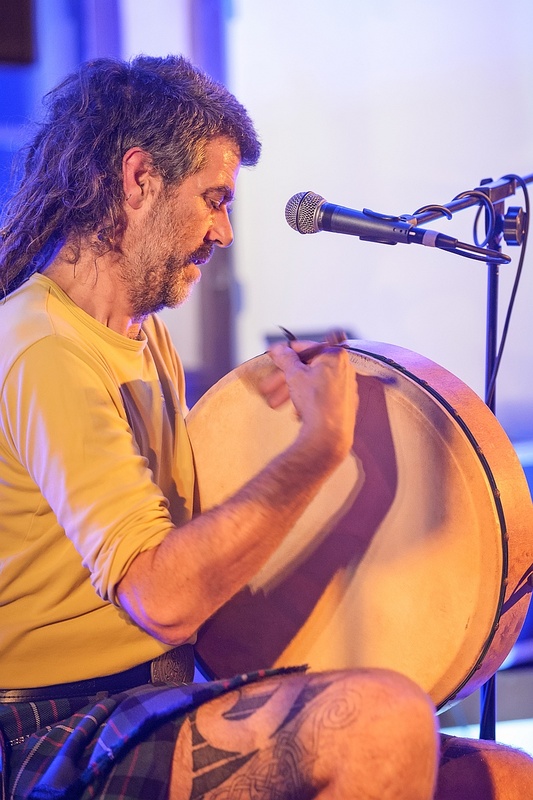 From there it took off, with Greig originally playing a djembé, until deciding later that the bodhrán lent itself much better to the folk sound of The Assassenachs. Nowadays the djembé is long gone and Greig is daily trying to fathom out the mystical secrets of the drum they call the bodhrán.